Birdfruit is a people-first team. We invest in each other as friends and athletes on and off the field. The time and effort we’ve put into our relationships off the field builds a trust that translates to on-field chemistry, connection, and conversation that make us stronger each season. Being successful and winning games comes as a result of these relationships. Birdfruit is a friends-based team. Finding the ideal point along the spectrum of being goofy, fun-loving, caring, focused, and intense is difficult, but balancing all those points simultaneously is where Birdfruit excels. Birdfruit is a hot mess of friendships – and more-than-friendships – that comes together each year to be a cohesive team. When we’re at our best, we’re silly, spontaneous, and down for anything. We’ll lick temp tats onto face at the bar on Saturday night, but we’ll also remember your name on Sunday morning. Birdfruit is a stand-for-something team. Each member of our flock brings a unique perspective from their lived experience, and we strive to make our team an inclusive, brave, and change-making space. We reflect on the privileges we hold, the world we want to live in, and the ways we can use ultimate as a positive force to get there. 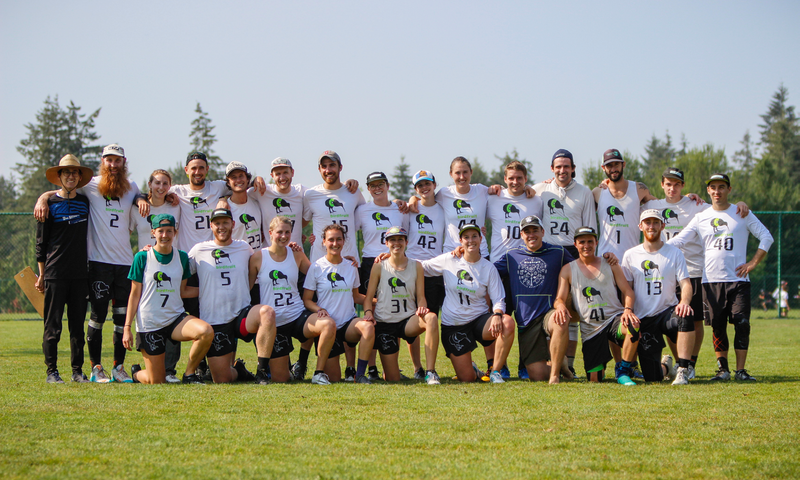 Through fundraising, conversation, and community engagement, Birdfruit advocates for gender equity, racial justice, and a sport that values and uplifts every individual who steps on the field. We establish intentional spaces to have meaningful conversations about how gender, sexism, and oppression show up in society, in our lives, and on the field. On and off the field, we ask each other to think critically and are always evaluating the things we do and say to see the ways inequity run through our lives. These conversations are often difficult, but because we value every single person on our team, it is essential that we all begin from a place of honesty. Some of the tangible ways we challenge norms are amplifying voices of women and encouraging men to step back and reflect on the roles they fill and the space their voices occupy. There is always more we can do, and we strive to ensure our on-field strategy mirrors our values through more equitable play time, roles, and leadership. We support groups like the All Girl Everything Ultimate Program (AGE UP) and do our part to support opportunities for young women, people of color, and players from low-income communities. We invest financially in AGE UP to ensure that these incredible youth players can play to their full potential. The women of Birdfruit join together with other women in mixed to play Huck The Patriarchy, a high-caliber women’s team that strengthens the bonds among the women we so frequently play against. One of the tools of sexism is creating unhealthy competition between women, so we come together to break that down, deepen our friendships, and challenge the patriarchy. We’re really good – like actually, we’re pretty damn good. But time playing with other women make us stronger contributors to our mixed teams. It’s a win win!